Your heart is about the size of your two fists clenched together. It beats about 72 times a minute. Each time it beats, it pumps 70 milliliters (1/3 cup) of blood. That amounts to 5 liters (1.3 gallons) per minute, 300 liters (78 gallons) per hour, or 7,200 liters (1,872 gallons) per day. The human heart is a fantastic pump! The chambers of the lower part of the heart. The stretching and relaxing of an artery as blood moved through it. The heart is located in the middle of your chest, between your lungs. The bottom tip is tilted a little to the left. The heart is made mostly of muscle. Like all muscles, it can contract, or draw in, and it can relax. Your heart beats steadily during your lifetime. It is the hardest-working muscle in your body. The size of the human heart varies with the size of the person. A large person is likely to have a rather large heart. In adults the weight of the heart also depends on the size of the person. The weight ranges from 229 grams (8 ounces) to 340 grams (12 ounces). During your growth period, the diameter of your heart increases about two and one-half times. 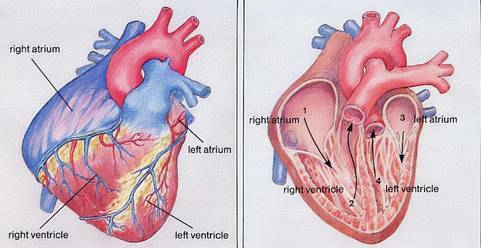 The drawing on the bottom left shows what the outside of the heart looks like. The drawing on the bottom right shows what the inside of the heart looks like. The heart is divided into four sections called chambers. The chambers at the upper part are called atria. The heart has a right and a left atrium. The chambers at the lower part are called ventricles. The heart has a right and a left ventricle. First, blood enters the right atrium, numbered 1 in the right-hand drawing. Then the blood flows into the right ventricle, numbered 2 in the drawing. When the heart contracts, the blood is pushed out of the right ventricle through a large artery. The blood flows through the artery to the lungs. There, oxygen enters the blood. The blood flows back to the heart and enters the left atrium, numbered 3 in the drawing. Next, the blood flows into the left ventricle, numbered 4 in the drawing. When the heart contracts, the blood is pushed out of the left ventricle through another large artery. This artery branches into many smaller arteries carrying the blood to all the body parts. The blood flows back to the heart from the body parts through veins and enters the right atrium again. Then the process starts over. Blood does not flow smoothly through arteries. If you turn a water faucet on and off very quickly, water will come out of the faucet in a spurt. Something like that happens when the heart contracts. The blood is pushed out of the heart and flows through the arteries in spurts. Where an artery is close to the skin, you can feel the blood spurting through it. The spurting you feel is called the pulse. The pulse is caused by the stretching and relaxing of the artery as blood spurts through it. The pulse count is equal to the number of heartbeats. How does exercise affect the pulse rate? A. Obtain these materials: a clock or wristwatch with a second hand. 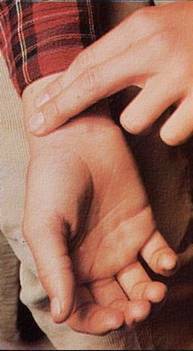 Place the index and middle fingers of 1 hand on the wrist of your other hand, as shown in the picture to the left. The movement you feel under your fingertips is your pulse. For 1 min, count the number of times you feel your pulse. 1. What number did you count to? 2. What was your pulse rate for 1 min? C. Stand next to your desk and do 30 jumping jacks. Take your pulse again. 3. What was your pulse rate this time? 4. How can you explain the difference between the 2 pulse rates? Blood flows much more smoothly in veins. The capillaries between the arteries and veins act something like the muffler in a car. The car's muffler smooths out the pulsing roar of the engine. In the same way, the capillaries smooth out the pulsing spurt of the blood as it enters the veins. The blood flows to the heart in the veins. What keeps the blood in veins flowing toward and not away from the heart? Why doesn't it flow backward? One reason is the action of the muscles in your arms and legs. As you move your limbs, the muscles squeeze the veins and push the blood toward the heart. Consequently, exercise improves your blood circulation. Another reason is the valves in the veins. The valves act like one-way doors. They open as the blood flows toward the heart. Then they close to keep the blood from flowing back toward the capillaries. The drawing shows the valves that prevent the backflow of blood in the veins. The heart is a muscle divided into four chambers called atria and ventricles. Blood flows out of the heart through the body in arteries. It flows back to the heart in veins. The pulse is a measure of the rate of heartbeat. Questions: Answer in complete sentences. 1. Where in the body is the heart located? 2. Which chamber of the heart does the blood enter first? 3. When the blood leaves the left side of the heart, it flows into a large artery. Where does it go from there? 4. How is the flow of blood in arteries different from the flow in veins? 5. The heart of a very healthy person may contract 68 times per minute. What is the person's pulse?